This book features many interesting and never before told stories about the people, places and events of Williamston, Michigan. 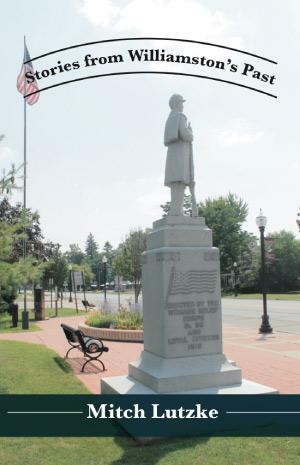 Written by Mitch Lutzke, a current high school history teacher, his years of research have led to the uncovering of some long forgotten tales about this mid-Michigan community. The book’s eighteen chapters include narratives about Chief Okemos and the founding Williams family and the settler’s view of the Native Americans. Williamston’s more than a century long coal mining industry is comprehensively detailed here. The arrival of the railroad in 1871, a violent citizens liquor protest, leading to massive arrests, the gruesome Haney murder case, excerpts from a farmer’s 1895 diary, the early days of professional and amateur baseball in town, a Presidential candidate visit, the true story of the Civil War solider, whose statue graces the city hall lawn, and the life of a Williamston mayor, who becomes a national economic reform crusader, are among the topics featured in this book. The author plans to donate a portion of the book’s profit to the Williamston Depot Museum, of which he is a board member.